For the most part, Southern California seasons are relatively mild compared to places where they get lots of snowfall, and it’s hard to picture having to winterize a California pool. So how do we handle the off-season pool service in our temperate climate? With the changing weather, we do get some cold nights, the wind and stormy weather, which increases the amount of debris and leaves from our yards and surrounding neighbors yards that end up in our pools. Just a few years ago on New Years Eve Lake Elsinore, Canyon Lake, and a few surrounding cities got several inches of snow. 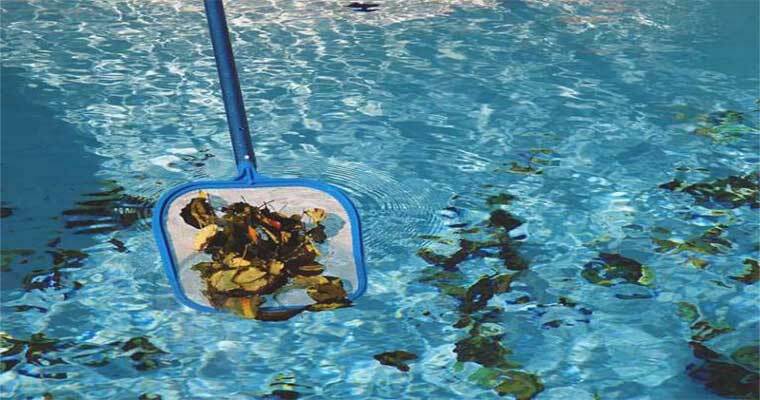 The increased amount of leaves and debris requires regular removal from the pool bottom, surface, pump baskets and skimmer to ensure proper circulation. We use helpful specialty tools and years of expertise that help us get this done fast and more efficiently for our customers. Whether you are in Lake Elsinore, Canyon Lake, Menifee, Murrieta, Wildomar or Temecula, pool service is not only recommended it’s required during the fall and winter season. If you decide to go it alone, it will take some extra effort and work to keep your pool in perfect shape throughout the colder months. The good news is you can cut back a bit on the chemicals and circulation times since algae growth is not a huge concern with the change in the sun and temperatures. Should You Winterize Your Swimming Pool? Our commercial pool clients like hotels and apartment buildings will often close their pools for the season, but many So Cal homeowners still want to blast the heaters and take a swim or relax in the spa. If you’re not planning on swimming, then you might consider winterizing your pool for a few months to prevent damage from freezing temperatures (depending on where you live), save money on utilities, supplies, and overall maintenance cost. What Does a Professional Pool Service Do In Winter? We continue to service our client’s pools during the fall and winter to assure that they are in good working order and ready for you if you and your family decide to turn off the pool heater and join the Polar Bear Club. If you want to winterize your pool and your not quite sure how to do it, give us a call at (951) 775-2678, and we can prepare your swimming pool and spa for the colder season. We do recommend that you continue regular pool service year round, to ensure your investment stays perfect year round. We know exactly what the colder season demands. So please let us know if we can be of service to you.